It's neither breakfast nor lunch. It's an ungodly union of both. I'm already indecisive so I don't need anything else in my life that is. It's one of those buzz words you hear all the time, mostly by yuppie people at country clubs. It's popular and trendy and I hate it. I'm either in the mood for breakfast (rarely since I kind of don't like breakfast foods) or lunch but not both. So, no, I do not want a chicken salad sandwich with grits and sausage egg muffins. If I want lunch, my tastebuds are set on lunch. Not grits and quiche. I don't want to eat my Chef Boyardee ABCs and 123s with scrambled eggs and biscuits. That's disgusting. -five- It's usually ridiculously expensive. People think they can overcharge for breakfast when it's at 11 AM. NO MA'AM! I see you! I see what you're trying to do. That sausage biscuit was $4 at 7 AM and now it's $11.95? Also, this does exclude breakfast for dinner. I often enjoy breakfast for dinner because it's completely breakfast (read: not some hybrid of foods) just at a different time of day. Brunch is my absolute favorite and it's an opportunity to drink champagne at 11AM. Win!!!! I definitely agree that it's overrated, but probably because I don't drink and therefore don't get to enjoy mimosas or Bloody Marys. This whole post is just wrong Apes. Brunch is absolutely the best thing. 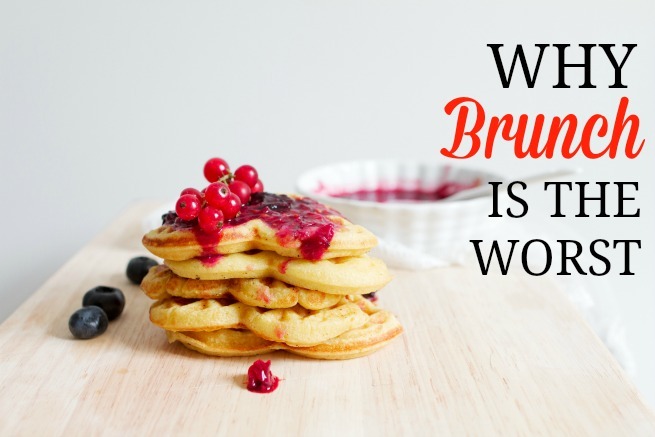 Alcohol with breakfast = alcoholic, alcohol with brunch = totally normal. Also getting to eat breakfast and lunch together is like heaven. This should be a list.